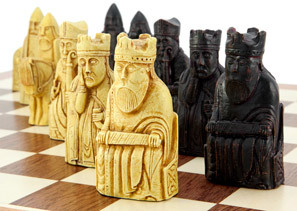 Since the discovery of the Lewis chessmen the design has been extremely popular. 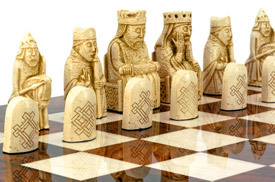 In fact today it has become the second biggest selling design of chess set. It is often classed as a themed chess set, but we prefer to think of it as a unique set in it's own right. As the popularity has grown so too has the range of chess set products available that pay tribute to the Lewis chess set. These amazing pieces have been reproduced in a variety of sizes, styles and from a range of materials. It is not possible to buy a selection of complete sets of pieces as well as individual pieces on their own. The national museum Scotland has done us a great service in producing a range of true to life products including a variety of full sets. When I say full sets I do of course mean just 32 pieces, not the full selection of over 50. These are after all chess sets used for playing the game, not the complete selection of pieces discovered in the legendary wooden casket all those years ago. The best stockist in the UK of Lewis products is without doubt The Regency Chess Company. They sell the official sets (made from laser scans of the original pieces), the SAC sets in two sizes and a variety of Lewis based souvenirs including actual sized individual pieces. The great thing about their selection is that they have combined these pieces with a selection of chess boards to create a huge amount of choice. Their range caters for those who just want one piece, a full set of pieces, or pieces and board for the full effect. You can contact the Regency Chess Company using the details below.